Throughout history there have been several Eastern and European cultures have used infusions from your favorite drinks. This drink was originally a meeting place to go with a gathering of friends or work, showed that in addition to this function provide beneficial health effects. 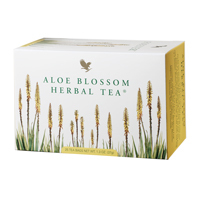 Aloe Blossom Herbal Tea is a healthy drink, natural, free of calories, with a delicious and distinctive taste of cinnamon. Contains no dyes, no artificial flavoring or preservatives and no caffeine.